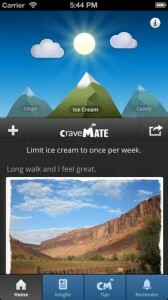 CraveMate is an iPhone app developed by Primitive Response Technology. The app’s slogan is “Hello CraveMate, Goodbye Junk Food!” CraveMate is a diet and fitness app that helps users to limit or avoid their habits of unhealthy, emotional eating. I read an article earlier this month that said 9 out of 10 people give up on New Year’s resolutions like fitness by January 10th. If you wanted to eat better this year, but still find yourself struggling, CraveMate may be just the aid you need to say no to empty calories and comforting treats. There’s a real sense of empowerment that comes from taking responsibility for your diet, and CraveMate does a good job of finding the balance between support and strength. The best diet success stories always involve an element of support from friends and family. 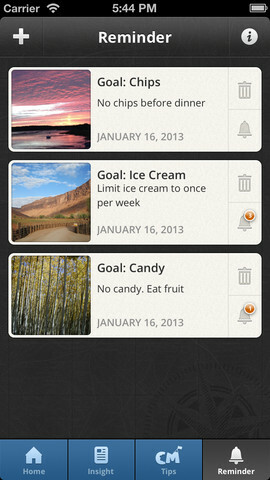 To that end, CraveMate provides a way to share photos with friends and family to show how you “beat” your last junk food craving. 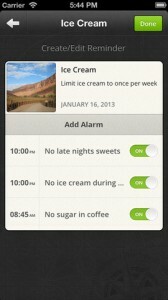 CraveMate lets users set Reminders and set Alarms for typical crave times. In the habit of eating a bowl of ice cream before bed, or a bag of potato chips during the football game? You can set a reminder just before these times in order to remind yourself not to give in to temptation. You can also set “crave goals,” such as limiting your cookie intake to just three per day, twice a week. If you have unstoppable junk food cravings when you diet, CraveMate is well worth the price you pay. The tone of the writing is wonderfully supportive, without being weak. 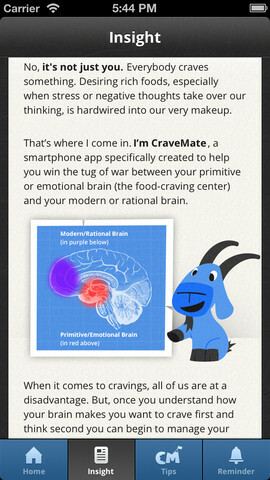 If you need an app that will give you the strength to resist the temporary joy a candy bar can bring in the middle of the night, CraveMate has got your back. 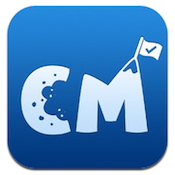 CraveMateis compatible with iPhone 3GS, iPhone 4, iPhone 4S, iPhone 5, iPod touch (3rd generation), iPod touch (4th generation), iPod touch (5th generation) and iPad. Requires iOS 5.0 or later. This app is optimized for iPhone 5.